“Trick” metabolism into not slowing down. Weight loss is the most common reason for people to try intermittent fasting. By making you eat fewer meals, intermittent fasting can lead to reduction in calorie intake. Calorie restriction is associated with weight loss and increased longevity. But if you overeat on free eating days it claws back the benefits. Additionally, intermittent fasting changes hormone levels to facilitate weight loss. In addition to lowering insulin and increasing growth hormone levels, it increases the release of the fat burning hormone norepinephrine (noradrenaline). Studies show that intermittent fasting can be a weight loss tool but not better than strict adherence to low calorie diet. If you binge and eat massive amounts during your eating periods, you may not lose any weight at all. Keep in mind that research is still in its early stages. Many of the studies were small, short-term or conducted in animals. Many questions have yet to be answered in higher quality human studies. Intermittent fasting can have many benefits for your body and brain. It can cause weight loss and may reduce your risk of type 2 diabetes, heart disease and cancer. It may also help you live longer. There is some evidence that intermittent fasting may not be as beneficial for women as it is for men. People who are underweight or have a history of eating disorders should not fast. There is also some evidence that intermittent fasting may be harmful to some women. Hunger is the main side effect of intermittent fasting. What are Some of the Concerns of Intermittent Fasting? We know that adequate caloric and nutrient intake is essential for reproductive health, particularly because amenorrhea (loss of menstrual cycle) is directly linked to under eating and low body weight. Athletic performance. Getting the most out of your workout really comes down to carefully timed fuel, and restricting calories for long periods of the day can definitely get in the way. Like most diets, IF can be really hard to stick with in the long run. One study actually compared IF to daily caloric restriction and found that the dropout rate was significantly higher among fasters than calorie-cutters. Some people binge when they are not fasting. 5. The evidence is still preliminary. One can drink non-caloric liquids during fast. Kids should not do this. Many people consider the 16/8 method the simplest and most sustainable way of intermittent fasting — you might want to try this practice first. If you find it easy and feel good during the fast, then maybe try moving on to more advanced fasts like 24-hour fasts 1–2 times per week (Eat-Stop-Eat) or only eating 500–600 calories 1–2 days per week (5:2 diet). Another approach is to simply fast whenever it’s convenient — simply skip meals from time to time when you’re not hungry or don’t have time to cook. You can experiment with the different approaches and find something that you enjoy and worksfir your schedule. Most people find the 16/8 method easiest to stick with. Studies on rats with intermittent fasting show: They lose weight, their blood pressure, cholesterol, and blood sugars improve. Studies in humans have shown intermittent fasting is safe and effective, but really no more effective than any other diet. In addition, many people find it difficult to fast. Dr. Jason Fung’s 2016 bestseller The Obesity Code. Fung is very clear that we should eat more fruits and veggies, fiber, healthy protein, and fats, and avoid sugar, refined grains, processed foods, and stop snacking. IF makes intuitive sense. The food we eat is broken down by enzymes in our gut and eventually ends up as molecules in our bloodstream. Carbohydrates, particularly sugars and refined grains (think white flours and rice), are quickly broken down into sugar, which our cells use for energy. If our cells don’t use it all, we store the extra as fat. But sugar can only enter our cells with insulin, a hormone made in the pancreas. Insulin brings sugar into the fat cells and keeps it there. Between meals, as long as we don’t snack, our insulin levels will go down and our fat cells can then release their stored sugar, to be used as energy. We lose weight if we let our insulin levels go down. The entire idea of IF is to allow the insulin levels to go down far enough and for long enough that we burn off our fat. Initial human studies that compared fasting every other day to eating less every day showed that both worked about equally for weight loss, though people struggled with the fasting days. New research is suggesting that not all IF approaches are the same, and some are actually very reasonable, effective, and sustainable, especially when combined with a nutritious plant-based diet. We have evolved to be in sync with the day/night cycle, i.e., a circadian rhythm. Our metabolism has adapted to daytime food, nighttime sleep. Nighttime eating is well associated with a higher risk of obesity, as well as diabetes. Based on this, researchers from the University of Alabama conducted a study with a small group of obese men with prediabetes. They compared a form of intermittent fasting called “early time-restricted feeding,” where all meals were fit into an early eight-hour period of the day (7 am to 3 pm), or spread out over 12 hours (between 7 am and 7 pm). Both groups maintained their weight (did not gain or lose) but after five weeks, the eight-hours group had dramatically lower insulin levels and significantly improved insulin sensitivity, as well as significantly lower blood pressure. The best part? The eight-hours group also had significantly decreased appetite. They weren’t starving. Just changing the timing of meals, by eating earlier in the day and extending the overnight fast, significantly benefited metabolism even in people who didn’t lose a single pound. There is some good scientific evidence suggesting that circadian rhythm fasting, when combined with a healthy diet and lifestyle, can be a particularly effective approach to weight loss, especially for people at risk for diabetes. 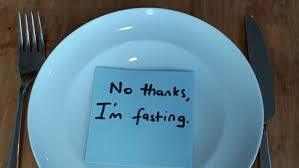 (However, people with advanced diabetes or who are on medications for diabetes, people with a history of eating disorders like anorexia and bulimia, and pregnant or breastfeeding women should not attempt intermittent fasting unless under the close supervision of a physician who can monitor you. Avoid sugars and refined grains. Instead, eat fruits, vegetables, beans, lentils, whole grains, lean proteins, and healthy fats (a sensible, plant-based, Mediterranean-style diet). Let your body burn fat between meals. Don’t snack. Be active throughout your day. Build muscle tone. Consider a simple form of intermittent fasting. Limit the hours of the day when you eat, and for best effect, make it earlier in the day (between 7 am to 3 pm, or even 10 am to 6 pm, but definitely not in the evening before bed). Avoid snacking or eating at nighttime, all the time.